A new study harnesses social media data to explore—in their own words—the reasons people use e-cigarettes and why they started vaping in the first place. 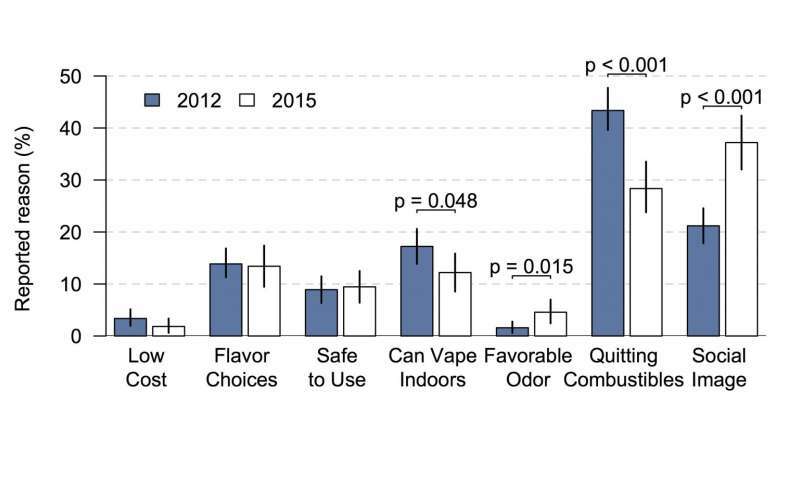 Nearly half of people say they began vaping in an effort to quit smoking cigarettes, while other reasons included their taste, the ability to use them indoors and their "cool factor." The work, led by San Diego State University researcher and public health surveillance expert John W. Ayers and published today in the journal PLOS ONE, gets around the inherent limitations and inaccuracies of survey responses by sourcing data directly from people's own comments on social media. "Just look to surveys from the recent presidential election or Brexit as examples of surveys' weakening ability to gauge public sentiment, attitudes or behaviors," Ayers said. "But what if we could listen in to what people are naturally saying about e-cigarettes to their friends rather than a surveyor?" To do just that, Ayers and colleagues mined Twitter data from more than 3 million public tweets about e-cigarettes between 2012 and 2015 to understand vaping's surge in popularity over that time. All English-language public tweets that included several e-cigarette terms (such as "e-cigarette" and "vape," among dozens of others) were captured from the Twitter data stream over that time period. 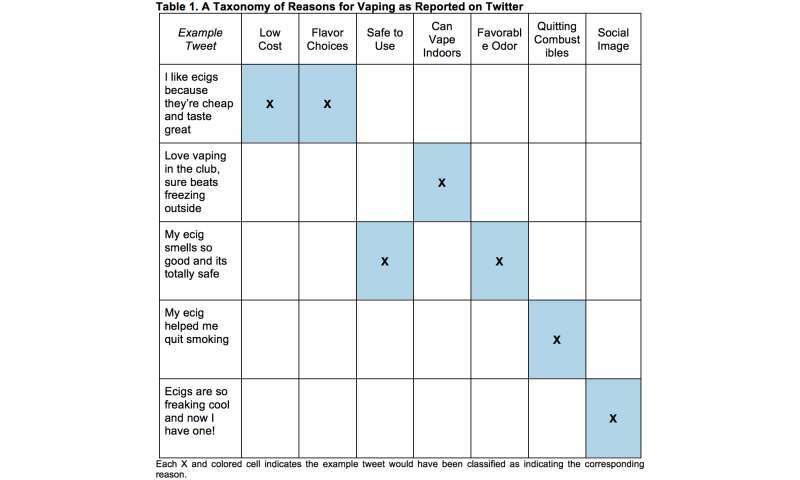 After excluding spam, advertisements, and retweets, posts from real Twitter users indicating their rationale for vaping were retained and classified. During 2012, quitting "combustibles"—cigarettes and other smoking tobacco products—was the most commonly cited reason for using e-cigarettes, mentioned in nearly half (43 percent) of all rationale-related tweets. Coming in second place was social image (21 percent), followed by ability to use indoors (14 percent), available flavors (14 percent), perceived safety (9 percent), cost (3 percent) and agreeable odor (2 percent). By 2015, though, the Tweeted reasons for using e-cigarettes had shifted. Both "quitting combustibles" and "ability to use indoors" significantly decreased in mentions. At the same time, social image became the most mentioned rationale in 2015, cited in 37 percent of the collected tweets. "The reasons people vape shifted away from cessation and toward social image during the time that e-cigarettes evolved from a cessation device to a freestanding tobacco product attracting smokers and nonsmokers alike," said Jon-Patrick Allem, one of the study's coauthor and fellow at the University of Southern California's Tobacco Center of Regulatory Science. "By utilizing Twitter, we can make public health more data-driven and understand vapers or those thinking of vaping," he added. Misinformation appears to drive some vapers' rationales for using e-cigarettes, the authors noted. "Some of the reasons people vape appear to be dubious," said Eric Leas, another coauthor and a graduate student in the SDSU-UCSD Public Health Joint Doctoral Program. "For example, vaping may be no less expensive than smoking combustibles, despite their naming that as a reason for vaping. Understanding how the public is potentially misinformed, rather than guessing, is a tremendous benefit for public health surveillance and practice." Monitoring social media data is a strategy that should be a standard practice in public health, the researchers argue. "Given the current prevalence of vaping, it would require more than 50,000 screening interviews and cost millions of dollars to have a single snapshot comparable to our study," said Mark Dredze, study coauthor and computer scientist at Johns Hopkins University. Ayers added that by thinking of Twitter and other social media streams as "a massive, passive focus group" allows for public health researchers to be better connected to the people they serve. "Without any priming or direct costs associated with data collection, public health can use social media surveillance to understand why people vape, yielding actionable intelligence for decision making on how to discourage vaping," he said. "Given that reasons for vaping can and do change, as we saw in our study, staying on top of these changes can potentially improve public health advocacy."